Memorial services for Frank "Peck" Picarski, 89, of Madison, will be held at later date by the Marine Corps League. 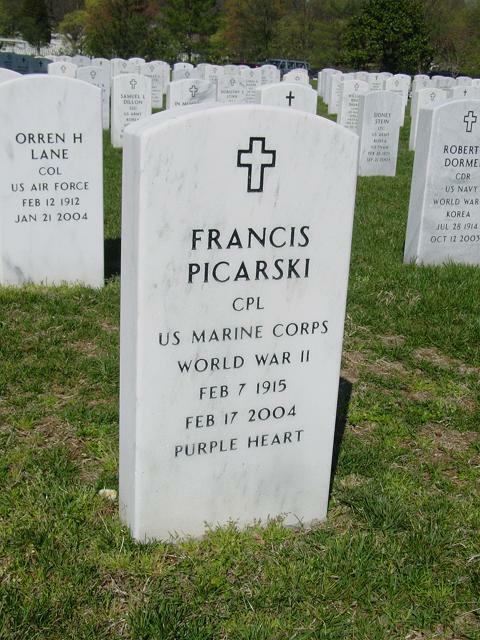 Mr. Picarski died February 17, 2004, in Madison. Born February 7, 1915, in Portage, Pennsylvania, he lived in Parma before moving to Madison. He was a U.S. Marine Corps veteran of World War II. He enlisted June 12, 1942, and was stationed at San Diego, California. He had two of his brothers, Joseph and John serving in the USMC B Company 3I6, Fourth Battalion. Mr. Picarski went to New Zealand on a ship called a LST 245, which later was destroyed. He landed on the following islands: Guadalcanal, Tarawa, where he was involved in the bloodiest battery, Abba Mamma, Pearl Harbor, Saipan, Madagascan, and Tianna. He was wounded several times and received two Purple Hearts. He was discharged in June 1946. The loves of his life were his dog, Toby, his grandchildren, family, and the Marine Corps, not necessarily in that order. He was also a member of the DAV, V.F.W., American Legion, Amvets, PPAL, and the Parma Elks. Mr. Picarski worked for the City of Parma as a heavy equipment operator for 25 years. Survivors are his children, Robert C of California, Venita K. Zidonis of Perry, and Nancy (Neal) Wagner of Canfield; grandchildren, Richard W. Zidonis, Shelly Cashbaugh, and Scott and Steven Wagner; great-grandchildren, Marissa, Mariah, Colleen, Shannon, Erin, and Brenna; sisters, Jenny of Michigan, and Mary of Pennsylvania; nieces, Margie and Gerri; and many other nieces and nephews. His wife Kay E. (Kalasoski) Picarski; parents, Anthony and Mary Picarski; and siblings, Helen, Stephanie, Agnes, Anna, Stanley, Walter, John, and Joseph, are deceased. Friends may call beginning at 1:30 p.m. Friday at his daughter, Venita's residence, 5401 Pebble Creek Lane, in Painesville. Burial will be in Arlington National Cemetery. The family suggests contributions be made to Toys for Tots, Lake County, 8720 Twinbrook, Mentor 44060, Attn. Tim DeWolfe, (440) 974-9380.